Biomorph can design and build a complete ergonomic office to the highest standards, for workplace or home, tailored to the client's needs and preferences. This includes desks, tables, storage, chairs, and lighting. Installation is available throughout the USA and Canada. Some recent projects are posted on our Cool Desks gallery here. Please call us at 888 302 3375 for further information and to get your project started. Conference tables are available in standard and custom sizes in all matching biomorph finishes, as well as custom finishes. 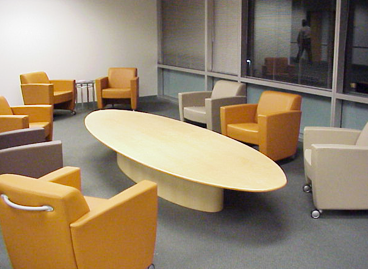 Tables can be fixed height or have full sit-to-standing adjustment, proven to achieve more effective meetings. Conference tables can accommodate 4, 6, 8, 10, or 12 people and are available with optional integrated power and data modules and wire management. 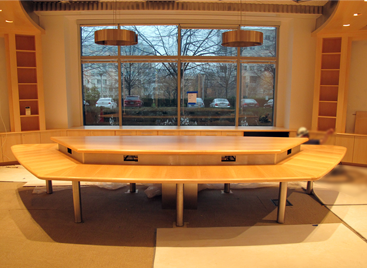 The conference tables feature double-layer construction for rigidity and stability. Standard legs are 2.375" diameter steel tube with levelers, with matte black, chrome or satin chrome finish, other leg options are available and they can have 4 or 6 height-adjustable legs.. Generally 6-8 weeks to ship date. Call 888 302 3375 for pricing of any and all tables in our conference selection. Biomorph builds the finest high-end architectural furniture and millwork to architectural specs for your project. Utilizing our state-of-the-art factory, we can build literally anything you or your designers can imagine, with the finest fit and finish available, to strict deadlines and can be installed anywhere in the world. Just contact us at 888-302-DESK or email us at info@biomorphdesk.com to get a quote.